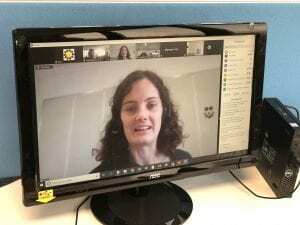 “Engineering is a hugely diverse profession open to all,” said Eleanor Davies, a structural engineer at BuroHappold, to the children listening to her online interview. The Leaders Award are running regular online interviews with engineers – ‘Meet an Engineer’ to inspire primary and secondary school children alike. Engineers who would like to support Primary Engineer / The Leaders Award can find out more here. Schools which would like to participate in Meet an Engineer interviews can find more information here. Eleanor Davies is part of the UWE Bristol Women Like Me scheme, that trains women engineers to run engineering activities in schools. Her interview took place on 21st November, and Eleanor told the Engineering our Future blog more about her experience in her guest post below. Yesterday, I was lucky enough to talk to over 1300 children at primary schools about what engineering is and what I do. Primary Engineer Leaders Award uses video calls to allow engineers to explain what they do to children and answer their questions in real time. This is a great way to engage many more children than simply going into one classroom, and to give them an understanding of what engineers actually look like and do. This is especially powerful at a young age when children are still curious about the world around them and stereotypes have not been formed. In particular, I really enjoyed answering the many insightful questions asked. It definitely brought back good memories of damming streams on the beach in Wales, watching Megastructures on TV and gave me a chance to reflect on my career so far. Hopefully, it also showed that engineering is a hugely diverse profession open to all. It offers amazing opportunities to apply maths and science to solve real world problems and to come up with tangible solutions that you can be proud of. Blog orginally posted by Laura Hobbs on 22nd Nov 2018 on the Engineering our Future blog.